ATCHERLEY.—INFORMATION is requested concerning ROGER (otherwise ROWLAND) ATCHERLEY, an officer, first in the Marines and later in the Militia, who died about 1833. He is believed to have been born about 1775, and was educated at Shrewsbury, under Dr. J. Atcherley, who it has been supposed was his uncle. I am always pleased to receive requests for information about members of the Atcherley family. Fortunately I was already familiar with Roger (a.k.a. Rowland) Atcherley [ ] before the above enquiry came my way. Having since carried out some further research and followed up the interesting leads regarding his military service, I am now in a position to provide a report. The enquirer, I know, will not object to me sharing it with the wider world through this website. 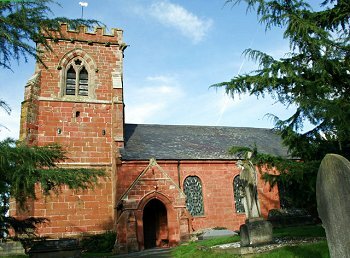 Roger Atcherley was baptised at Kinnerley in Shropshire on 1 September 1771, the third of four sons born to Richard Atcherley [ ] and his wife Elizabeth (née Oliver). The baptism records for Richard and Elizabeth’s first three sons show that Richard was a gentleman, who lived at Edgerley, a township within Kinnerley parish. Sadly, the entry in the baptism record for the couple’s fourth and last son, dated 29 March 1773, reads “Richard Son of Elizabeth Atcherley of Edgerley by her late Husband”. Richard Atcherley senior had been buried just over a month earlier, on 21 February. So Roger grew up with, at best, only dim memories of his father. Was he educated at Shrewsbury school? It is entirely possible, but unfortunately we cannot be certain one way or the other. This is because the register of admissions to the school for the period in question was lost. The disappearance of the register took place during the headmastership of the Reverend James Atcherley during his tenure from 1771 to 1798. James Atcherley of Shrewsbury was not Roger’s uncle, but I believe he was a first cousin once removed of Roger. Given this relationship, Roger may well have known the Reverend Atcherley even if he did not attend Shrewsbury School – and this raises an interesting possibility. James’s most famous son was another James Atcherley, who in 1794 became a Second Lieutenant in the Royal Marines (see An Atcherley at Trafalgar). This was at a time when Britain was at war with revolutionary France and fearful of invasion. Defence forces were being expanded both on land and at sea. Roger Atcherley’s own patriotic desire to help defend his country may alone have been enough to make him join the armed forces. It is however tempting to think that he may have been influenced – if only when choosing which service to join – by the example set by his second cousin, James Atcherley. The List of the Officers of the Army and Marines, published in 1800, included entries for two men with the surname Atcherley, both officers of the Marine Forces. One was James, recorded as holding the rank of First Lieutenant from 24 April 1795. The other was named as Robert, who had been Commissioned as a Second Lieutenant on 2 May 1798. Since there were no members of the Atcherley family named Robert living at that time, it seems likely that this was actually Roger. The List of the Officers of His Majesty’s Royal Marine Forces published in 1803 reinforces this view. The Atcherley it shows as a Second Lieutenant of the Marines with a Commission dated 2 May 1798 is named as Roger. He had been appointed to the 36th Company of the Marines on 1 June 1802 and was based with them at Plymouth (as was James, with the 33rd). However, the List of All the Officers of Army and Royal Marines on Full and Half-pay published in 1805 does not include Roger, only James (who was by then a Captain), so Roger had left the Service before that time. Regrettably, I have not been able to find any other information regarding Roger Atcherley’s life in the Royal Marines, or exactly how and when it ended. The Peace of Amiens in 1802 had lessened the fear of invasion and Roger may have resigned his Commission not long after the 1803 List of the Officers of His Majesty’s Royal Marine Forces was compiled. It appears that Roger then remained in Devon, settling at Newton Abbot in the parish of Wolborough. It is just possible therefore that he might have become a member of Haytor Regiment of Volunteer Infantry when it was formed, along with other Militia units across Devon (and beyond), in March 1803. The King’s warrant to ‘draw out and embody’ the Militia was just one of the preparations Britain made before ditching the short-lived Peace of Amiens. Having entered into a treaty of peace with France, Britain had become concerned that it was simply giving France an opportunity to expand, without hindrance, its territory and power in Europe and the colonies. Being also distrustful of Bonaparte’s future ambitions, Britain decided to act pre-emptively. With preparations for both offence and defence underway, war on France was declared on 18 May 1803. Many stories remain of this period of service. I cannot say how long the Volunteers were out; probably they relieved each other. One story frequently told was of the French fire-ships for which they were on the look-out, to be sent among the fleet in the bay, and which caused much stir. One night as the full moon rose red and fiery out of the sea the sentry at the headland, who had come from an inland parish, mistook it for a fire ship, discharged his musket, and aroused the garrison. The uniform was similar to the line regiments of the period, viz., scarlet swallow tailed coats, turned out with yellow, blue black breeches, white cross belts, with a brass plate having Haytor Regiment thereon; the pouches were black, the buttons had H.V.R.—Haytor Volunteer Regiment, officers wore cocked hats, others tall shakoes. Amery also stated that the Haytors were disbanded about 1809, but there is evidence to show that the regiment continued for a few years beyond then. On 11 April 1810 for example, “the Haytor regiment of Volunteer Infantry, 970 strong, were inspected by Colonel Barne; after which they went through a field-day, under the command of Lieut.-colonel Babb”. In December of that year Lieutenant-Colonel Babb’s death was reported, and it was stated that “His brother officers, and the regiment, have lost a good friend”. One of Babb’s brother officers was Roger, or, as he was by then known, Rowland Atcherley, whose marriage under that name, to Eliza Oliver, took place at Walcot in Somerset on 24 May 1810. Just when – or why – Roger changed his given name is unknown, but clearly his moniker had morphed by 1810 and all records in which he is mentioned after this time refer to him as Rowland (or R) Atcherley (or Atcherly). A letter which he wrote in his capacity as Adjutant of the Haytor Regiment on 18 July 1807 provides no help here, as this is said to have been written by “H. R. V. K. Atcherly” (probably Haytor Regiment of Volunteers, R. Atcherly). He was, incidentally, still Adjutant of the regiment in 1813 when his son – also named Rowland – was baptised at Wolborough. The baptismal records for the three children born to Rowland and Eliza after Rowland junior show the “Quality, Trade, or Profession” of the father as Gentleman. It seems likely that by 1814, Rowland Atcherley’s association with the Haytor Regiment was over. Rowland Roger Atcherley On the sixteenth day Admon of the Goods Chattels and credits of Rowland Roger Atcherley formerly of Edgerley in the County of Salop afterwards of Exmouth in the County of Devon but late of Castle Town in the Isle of Man Esquire deceased was granted to Eliza Atcherley Widow the relict being first sworn duly to administer. On looking for a record of Rowland Atcherley’s burial on the Isle of Man, I was initially disappointed. Then I searched on his forename, Rowland, and found the burial of “Rowland Stoherly”, age given as 57, at Malew (the Manx parish including Castletown) on 26 August 1831. Being all too familiar with the range of transcription errors the name Atcherley or Atcherly is subject to (especially in places where the name is not familiar), I was convinced that this record in fact related to Rowland Atcherley’s interment. Having now seen a copy of the original register at FamilySearch, I can confirm that it reads “Rowland Atcherly Esqr, 57″. So ends my report on the life of Roger, otherwise Rowland, Atcherley. Unfortunately the person who made the enquiry about him, which appears at the beginning of this article, will not be able to read it. Giving his address as “A., post-office, Rivington, Chorley”, he was undoubtedly Rowland’s grandson Rowland John Atcherley. His request for information was printed in The Times of 4 April 1873, and he died 18 years later, on 8 September 1891. My response to his plea is, unavoidably, more than a century too late. I’m left wondering whether anyone from his own time was able to tell Rowland more about his grandfather, an officer and a gentleman who served his country, as marine and militia man, in its time of need. Picture credits. 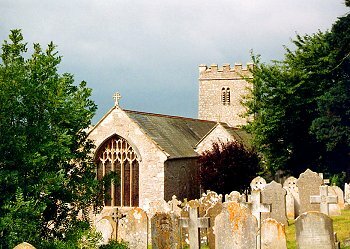 Kinnerley St Mary: adapted from image © copyright J Scott, taken from Geograph and used (and made available for re-use) under a Creative Commons Licence. Soldier in uniform of 9th Foot, 1812 (similar to the uniform of the Haytor Regiment): cropped and adapted from Encyclopaedia Britannica image, taken from Wikimedia Commons and in the public domain. Wolborough St Mary: adapted from image © copyright John Salmon, taken from Geograph and used (and made available for re-use) under a Creative Commons Licence. 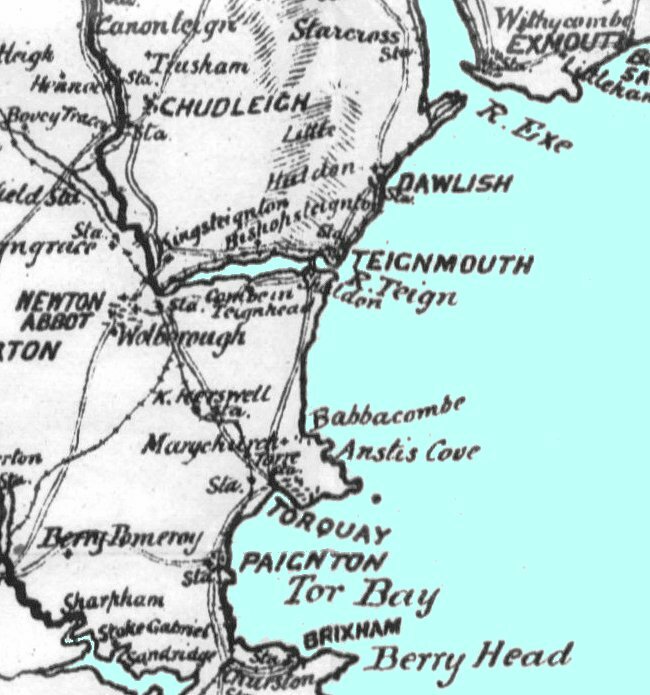 Map of Newton Abbot and surrounding area (including Berry Head and Exmouth): cropped and adapted from map on page 407 of ‘The Rivers of Devon from source to sea’, published 1893, taken from the British Library’s Flickr Photostream; no known copyright restrictions. The Times, issue 27655, 4 Apr 1873, page 1. Kinnerley, Shropshire baptism register covering 1771, entry for baptism of Roger Atcherley. Copy viewed at Findmypast. Kinnerley, Shropshire baptism register covering 1767, entry for baptism of John Atcherley. Copy viewed at Findmypast. Kinnerley, Shropshire baptism register covering 1769, entry for baptism of James Atcherley. Copy viewed at Findmypast. Kinnerley, Shropshire baptism register covering 1773, entry for baptism of Richard Atcherley. Copy viewed at Findmypast. Kinnerley, Shropshire parish register covering 1773, entry for burial of Richard Atcherley. Copy viewed at Findmypast. George William Fisher, John Spencer Hill (1899), Annals of Shrewsbury School. Pages 254-5. Copy viewed at Internet Archive. Robert Holden Mackenzie (1913), The Trafalgar roll. Lieut.-Col. Amery (1888), The Haytor Volunteers: Their History and Development. Copy viewed at Internet Archive. War Office (1800), A List of the Officers of the Army and Marines. 48th Edition. Pages 391 and 398. Copy viewed at Google Books. Admiralty Office (1803), A List of the Officers of His Majesty’s Royal Marine Forces. Table 24. Pages 18 and 34. Copy viewed at Google Books. War Office (1805), A List of All the Officers of Army and Royal Marines on Full and Half-pay. Page 409. Copy viewed at Google Books. Trewman’s Exeter Flying Post, 30 Jun 1803, page 1. Christopher David Hall (1992), British Strategy in the Napoleonic War, 1803-15. Page 102 et seq. Preview copy viewed at Google Books. Salisbury and Winchester Journal, 1 Oct 1804, page 4. Trewman’s Exeter Flying Post, 26 Apr 1810, page 1. Trewman’s Exeter Flying Post, 20 Dec 1810, page 4. FreeREG shows marriage of Rowland Atcherley and Eliza Oliver. Wolborough, Devon baptism register covering 1813, entry for baptism of Rowland Atcherley. Copy viewed at Findmypast. Wolborough, Devon baptism register covering 1814, entry for baptism of Caroline Atcherley. Copy viewed at Findmypast. Wolborough, Devon baptism register covering 1816, entry for baptism of Charlotte Atcherley. Copy viewed at Findmypast. Wolborough, Devon baptism register covering 1818, entry for baptism of Charlotte Atcherley. Copy viewed at Findmypast. Trewman’s Exeter Flying Post, issue 2454, 17 Sep 1812. Transcript available atGenuki. Trewman’s Exeter Flying Post, issue 256029, Sep 1814. Transcript available atGenuki. Trewman’s Exeter Flying Post, issue 2693, Thursday 24 Apr 1817. Pigot & Co. National Commercial Directory (1830). Page 211. Re: Atcherley, at Manx Genealogy Archive (website, accessed 20 Jul 2014). FamilySearch shows burial of Rowland Stoherly, age 57, on 26 Aug 1831 at Malew, Isle of Man. Digital folder 004496872, Image 00338.